Happy Chinese New Year! It's the Year of Dog. Gong xi fa cai! 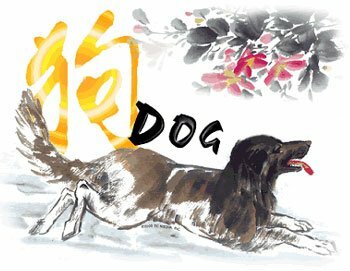 You are born in the Year of the Dog if you were born in one of the lunar years below. Dogs are meant to be responsible, compassionate, reliable, honest, pessimistic, anxious, overwhelming and nosy! There are many different beliefs and superstitions about each animal, and more about the dog can be found here. I was born in 1986. With my luck thats probly year of the jackass. LOL! Actually, 1986 was the Year of the Tiger, so that's probably what you are. Unless you were born before 9 February in that year, making you an ox! Did someone mention "Dog" ? Yay! I'm a tiger! Give me a giant steak or I'll eat you! Sure, everyone loves steaks. They're Grrreat! I'm in heaven! :-D I love the inscribed rectangles! I shall approximate the volume before devouring! From Wikipedia article on Rat Sign: According to Chinese folklore, people who are born under this Chinese sign are creative, honest, generous, ambitious, quick-tempered and wasteful. Dragons are easily the best Chinese New Year animals. Do you mean dragon's, mathsy? thanks and its "(gives her a piece)"
where d'you live any way ? And of course the liberty bell. One of the oldest and most historical cities in the US. Must be nice.